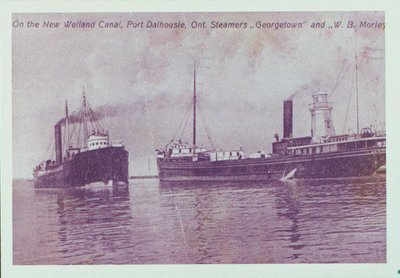 A photograph of a postcard of the steamers "Georgetown" & W.B. Morley” on the New Welland Canal, Port Dalhousie, Ontario. 1911. F.H. Leslie Publisher, Niagara Falls, Canada. On the New Welland Canal, Port Dalhousie, Ont. Steamers "Georgetown" and "W.B. Morley"